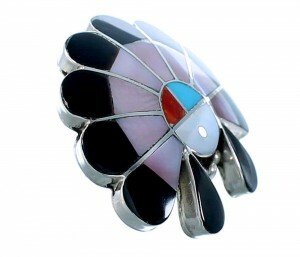 Sterling silver, real Turquoise, Coral, Jet, Pink Shell, and Mother of Pearl. 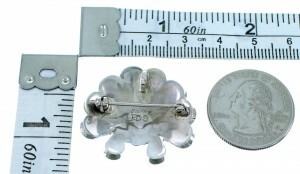 Pendant measures approximately 1" long (including bail) and 1-1/8" at widest point. 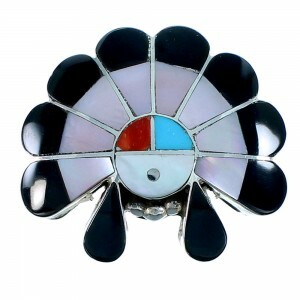 This pin pendant is a Zuni classic! This piece of Native American jewelry is Zuni hand crafted by artist Denise Siutza, out of genuine sterling silver, along with real multicolor inlay. The inlay consists of: Turquoise, Coral, Jet, Pink Shell, and Mother of Pearl. The inlay is carefully set, creating a beautiful chief headress design. Mini silver beads accent the pin pendant for a magnificent finish. This wonderful pin pendant can be pinned onto clothing and worn as a brooche, or put on a chain and worn as pendant! The pin pendant is stamped sterling and hallmarked.